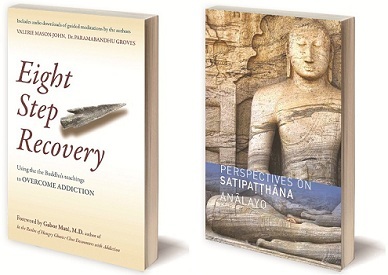 In one month’s time we will be releasing Valerie Mason-John and Dr. Paramabandhu Groves’ Eight Step Recovery: Using the Buddha’s Teachings to Overcome Addiction, described by Sarah Bowen as ‘a practical and compassionate step-by-step guide to freedom from the deep trappings and suffering of addiction’. Find out more about the book by downloading our Eight Step Recovery Sample Booklet, and if you like what you read you can pre-order the book on our website. Also In January 2014 we will be releasing Anālayo’s Perspectives on Satipaṭṭhāna, an exciting new book which builds on Anālayo’s earlier ground-breaking work, Satipaṭṭhāna: The Direct Path to Realization. Sharon Salzberg has described the book as ‘A work of great scholarship and wisdom that will be of immense benefit to anyone who wants to seriously study or to establish a practice of mindfulness’. Perspectives on Satipaṭṭhāna is also available to pre-order – please visit our website for more information and look out for an interview with Anālayo on our blog later this month.